“These pink salmon that we got in early this year are some of the largest I’ve seen in quite a long time,” said John Joyce, fisheries research biologist at National Oceanic and Atmospheric Administration’s Ted Stevens Marine Research Institute, in an interview last summer. 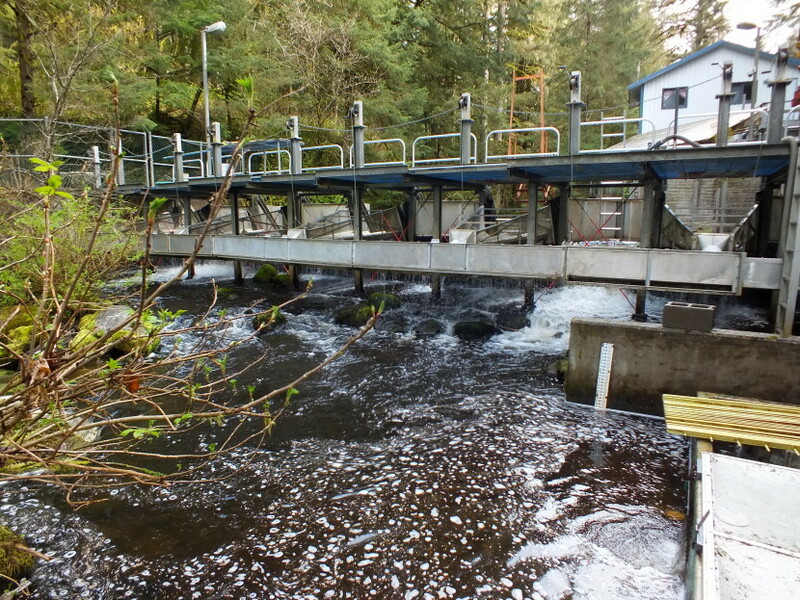 As Auke Creek flowed over rocks and returning salmon lingered in a nearby pool, Joyce explained how the creek’s weir provided more than 35 years of continuous data that is valuable for climate change research. Joyce said the adult pink salmon are returning earlier every summer, a total of two weeks earlier since counting started. Pinks returning in 2015 also came back in big numbers in the northern part of Southeast Alaska, and they’re bigger than usual. For just the Panhandle, pink salmon harvested in 2015 were 12 percent heavier than the previous year. During the Salmon Ocean Ecology Meeting held in Juneau in March, research biologists presented their findings suggesting pink salmon runs may be affecting the growth and abundance of other salmon species in the north Pacific. 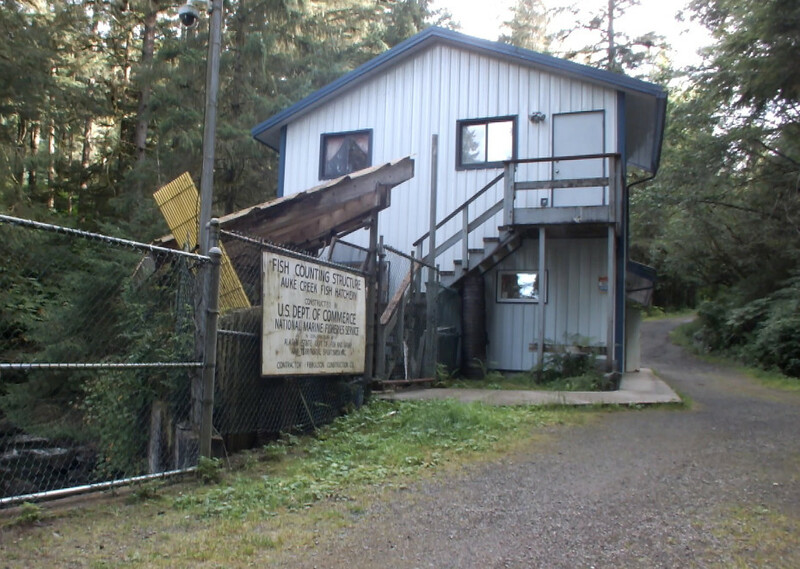 Leon Shaul, coho research project leader for Southeast Alaska for the Alaska Department of Fish and Game, said they’ve noticed a trend develop in the Gulf of Alaska and Southeast Alaska over the last several decades. Older chinook and coho are getting smaller while young reds and pinks are getting bigger. “The size of salmon the region have shown a pattern of convergence with everything that was smaller 30, 35 years ago trending larger and the larger fish trending smaller,” Shaul said. 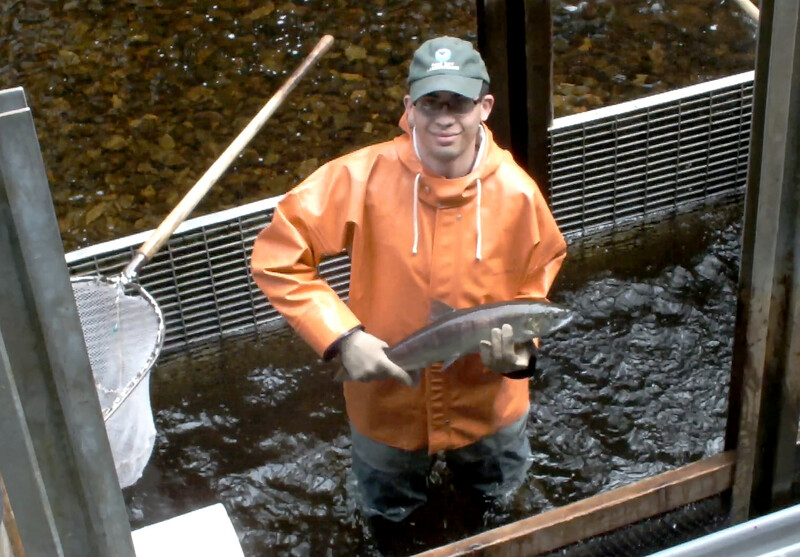 Shaul wonders if the salmon’s forage base is being altered by the recent swings in water temperature. When ocean temperatures are cool, young pink salmon usually grow by feeding on the bigger and fattier zooplankton. It just so happens that squid like zooplankton, too. It’s possible that when pink salmon bulk up by consuming squid, they’re also depriving offshore coho and chinook of their primary food source. Shaul acknowledges they still haven’t pinned down whether young pinks are benefiting from more zooplankton because those older pinks are scooping up all the squid. And since less fatty zooplankton are prevalent during warm conditions, they’re not sure how pinks are still getting bigger with the recent warm water Blob in the northeast Pacific. Elsewhere in the north Pacific, researchers have already documented what they believe is one salmon species possibly crowding out another. During the Juneau conference, Greg Ruggerone of Seattle-based Natural Resources Consultants reviewed earlier research on how eastern Kamchatka pink salmon runs may be affecting Bristol Bay red salmon abundance. Pinks usually take two years to mature while reds usually take three years. Since both stocks intermingle in the north Pacific, huge pink runs compete for food with the young reds during their second year at sea. As well as less growth for red salmon, Ruggerone said there are fewer of them in alternating years.